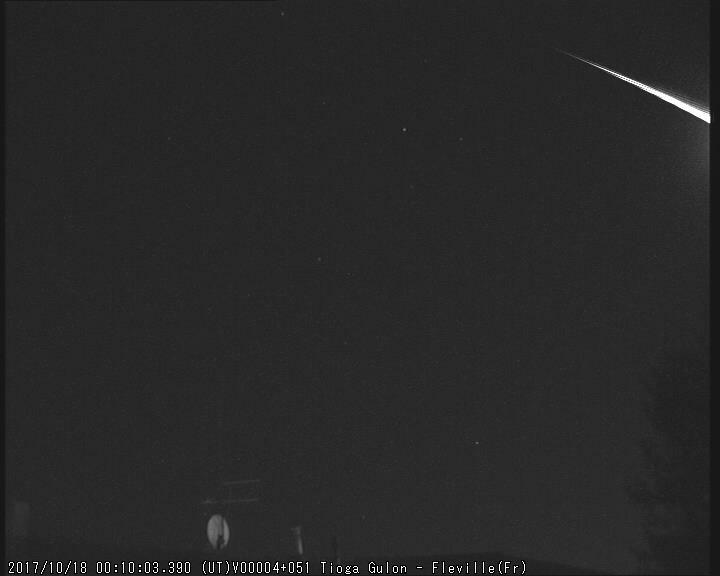 The third and last report of the most interesting meteor events recorded during 2017 by the French network BOAM is presented. Each year, the period between October and December is marked by the activity of a dozen major showers. 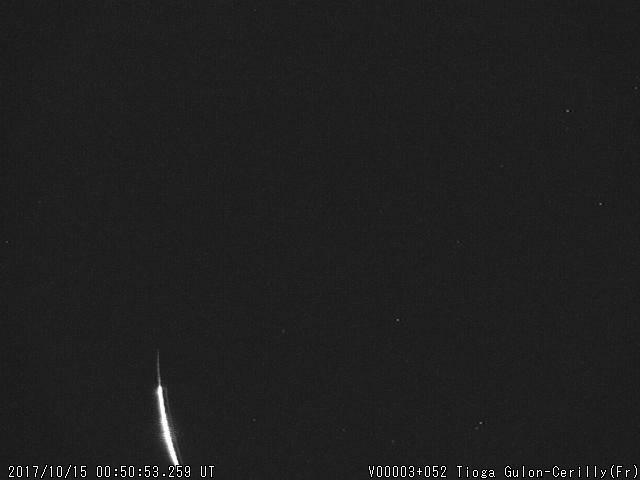 The maxima of the Orionids and the Geminids were key moments for the BOAM network and nice fireballs occurred during these three months. Figure 1 – Overview of the number of captures for the period October to December 2017 – GraphBoam. 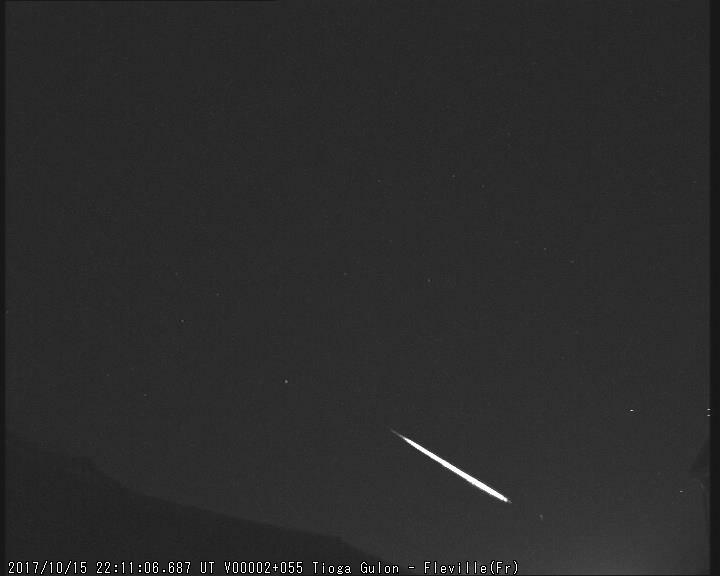 Orionid meteors are dust ejected by the famous Halley comet when it comes close to the Sun every 76 years. The Earth crosses the particle cloud released from the nucleus two times per year giving two single meteor showers : η-Aquariids in May (easily observable from the Southern Hemisphere) and Orionids in October. Figure 2 – Characteristics of the Orionids. This year, we had New Moon on October 19th and this made it possible to observe the maximum activity of the Orionids with a beautiful dark sky. 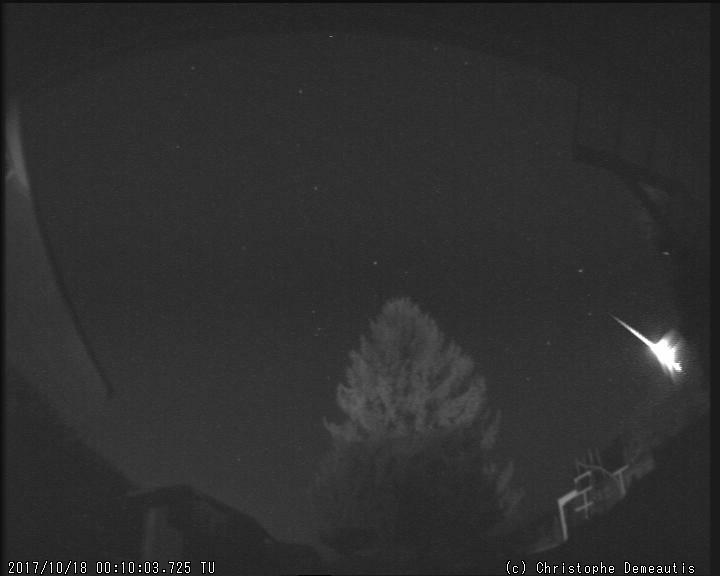 Figure 3 – stacked picture of 48 Orionids from the stations LITIK1 and LITIK2 (Fleville – France) during the night of October 22th. We have recorded 403 Orionids during the activity period, allowing to calculate 57 orbits, radiant positions and trajectories with datas from UKMON and FMA. Figure 5 – 57 Orionid trajectories on a ground map – UFOorbit. Figure 6 – 57 Orionid radiants on a gnomonic projection sky map – UFOorbit. Figure 7 – 57 Orionid orbits on solar system map : top view, side view – UFOorbit. Rq : The semi-major axis of the orbit calculated depends a lot on the velocity of the meteor, the accuracy is rather poor for this element. The Geminid shower is active from December 4th to 17th with a large peak during the night of December 13th to 14th, maximum ZHR around 120 meteors per hour. 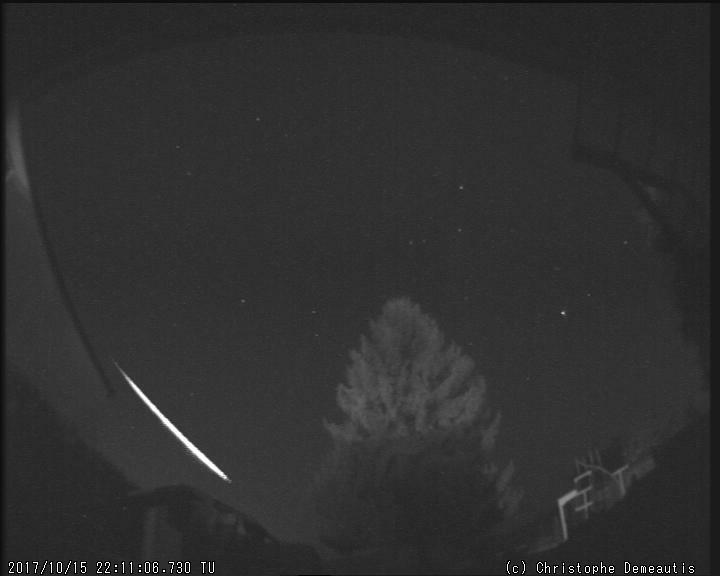 The meteoroids entry velocity is 35 km/s, leaving few persistent trails. These shooting stars appeared in 1862 and their origins remained a long time unknown until 1983, date of the discovery of the parent body, the asteroid Phaethon. Figure 8 – Characteristics of the Geminids. This year, the observation conditions were optimal with an absent moon (New Moon on December 18). The maximum was predicted for December 14 around 06:30 UT but it was appropriate to be attentive between 13:50 UTC December 13 and 11:05 UTC December 14, 2017 because over the last twenty years, the most beautiful maxima observed occurred between 261.5 ° and 262.4 ° of solar longitude. The maximum visible activity was around 2-3 o’clock in the morning when the radiant is high in the sky. 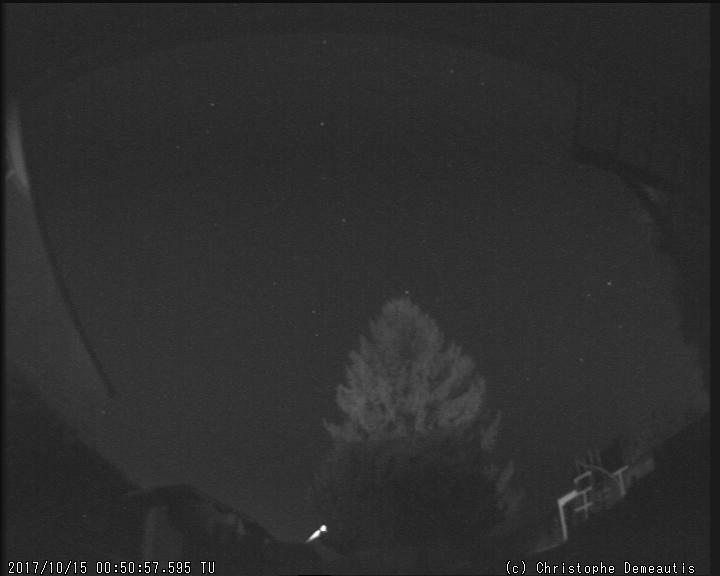 The weather conditions were bad that night on France, except for the cameras of the northern third which had clear skies on the second half of the night. We recorded 513 geminids in 2017, allowing trajectory calculation of 111 of them thanks to data from neighboring UKMON and FMA networks. Figure 14 – 111 Geminids orbits in the solar system map : top view side view – UFOorbit. 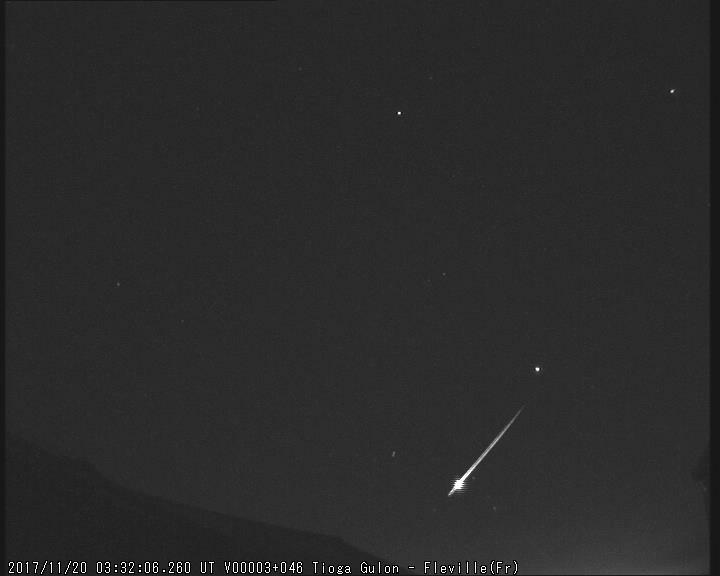 This beautifull fireball crossed the sky through the zenith over AstroChinon observatory (station CHI37) enlightening the sky for more than 6 seconds with multiple fragmentations. 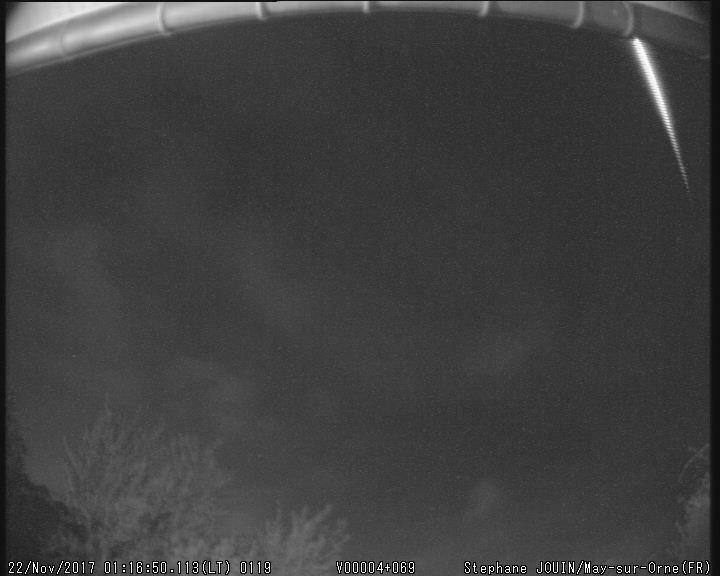 On the record, the magnitude of moon at the horizon is -12 and although the fireball seems to cross mist scattering its light we can estimate the maximum magnitude around -9. 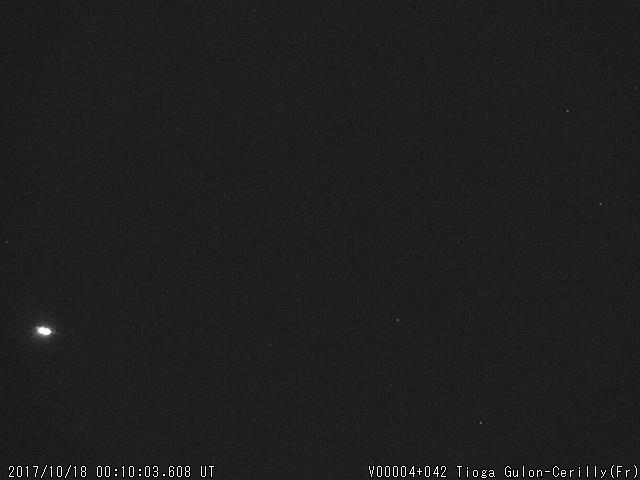 Unfortunately, we have not been able to do a triangulation calculation, 3 cameras recorded the event but only the station CHI37 is calibrated in astrometry. Figure 19 – M20171015_005053 – Cérilly (France) – T. Gulon. Figure 20 – M20171015_005053 – Bollwiller (France) – C.Demeautis. Figure 21 – M20171015_005053 – Val Terbi (Switzerland) – R.Spinner. Figure 23 – M20171015_221106 – Bollwiller (France) – C.Demeautis. Figure 24 – M20171015_221106 – Val Terbi (Switzerland) – R.Spinner. Figure 25 – M20171015_221106 – Fleville (France) – T.Gulon. Figure 26 – M20171015_221106 – Bos-Cha (Switzerland) – J. Richert. Figure 28 – M20171018_001003 – Bollwiller (France) – C.Demeautis. Figure 29 – M20171018_001003 – Fleville (France) – T.Gulon. Figure 30 – M20171018_001003 – Val Terbi (Switzerland) – R.Spinner. Figure 31 – M20171018_001003 – Chaligny (France) – Marco. Figure 32 – M20171018_001003 – Cérilly (France) – T.Gulon. Figure 34 – M20171120_033206 – Fleville (France) – T.Gulon. Figure 35 – M20171120_033206 – Val Terbi (Switzerland) – R.Spinner. Figure 36 – – M20171120_033206 – Bos-Cha (Switzerland) – J. Richert. 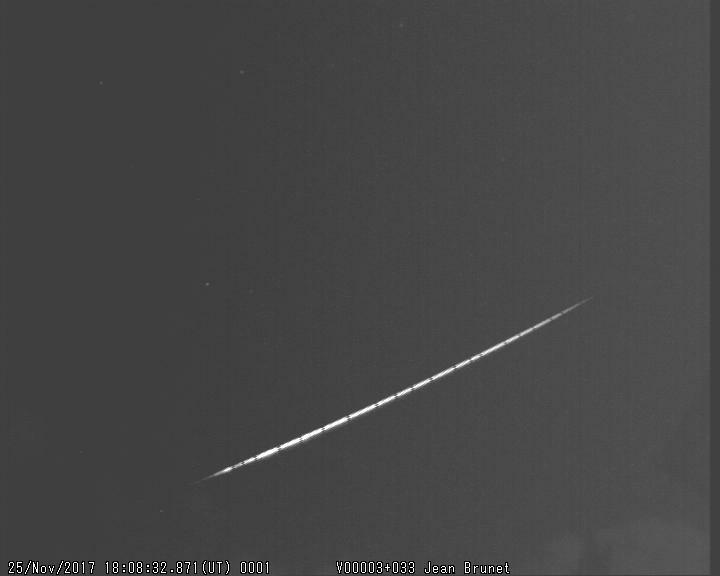 Nice multidetection between Norman stations MSOI_J1, FNM1_JB and Swiss station VTE-6 located 550 km from the fireball. Figure 38 – M20171122_001650 – May-sur-Orne (France) – S. Jouin. Figure 39 – M20171122_001650 – Fontenay (France) – J. Brunet. Figure 40 – M20171122_001650 – Val Terbi (Switzerland) – R.Spinner. Figure 42 – M20171125_180832 – Fontenay (France) – J.Brunet. Stream : Sporadic, Absolute magnitude : -2.9 Duration time : 5.39 s, Velocity : 14 km/s, Height of start : 80 km, Height of end : 46 km, Trajectory lenght : 77 km, Inclination : 26°, Radiant ra. : 310° dec. : -11°. On IMO fireball event, Nicolas H., a newspaper deliverer at work reported to have observed a kind of “mini Sun” burst in 4 or 5 explosive light points then turning into new explosive fragments. 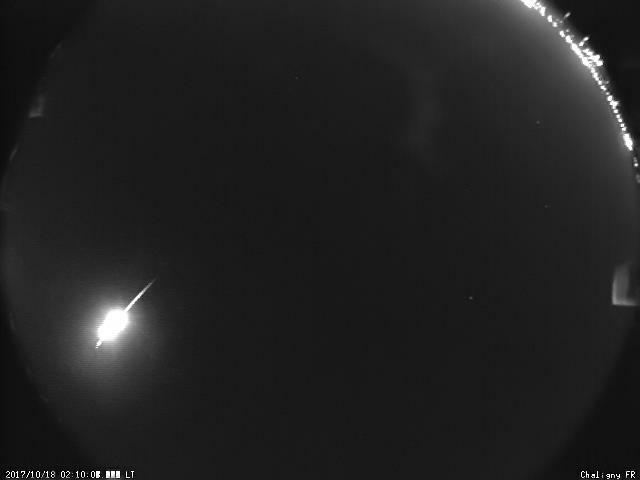 The fireball lighted up the sky over Vendée, a region of the Atlantic cost of France, and was recorded by three video networks and 8 radio receivers. 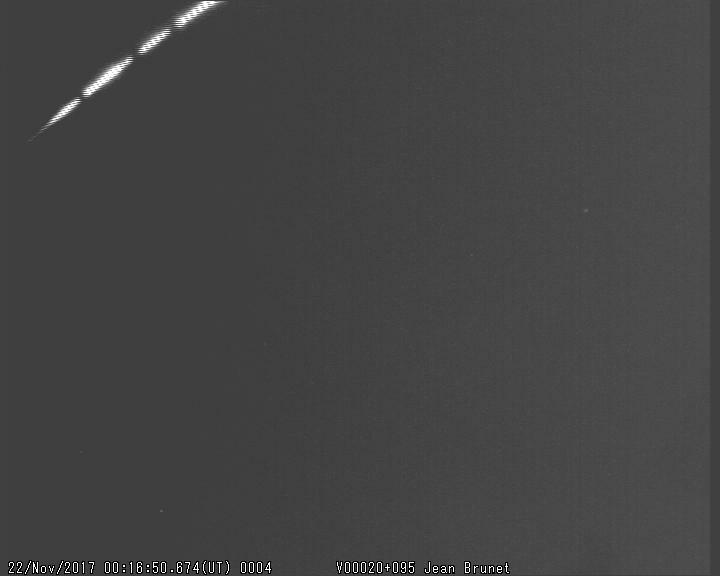 The image from UFO-science network’s camera at La Rochelle, just below, shows an unusual bright event but no one has enough informations to calculate an accurate trajectory. Figure 44 – M20171226_042231 – Chinon (France) – Astrochinon. Figure 45 – M20171226_042231 approximative position. Figure 47 – Record from Nantes, Royan, Talence, Angers et Coulounieix © Fripon.